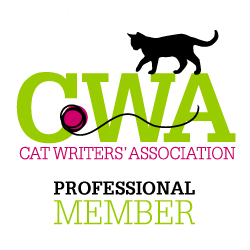 Three Chatty Cats is proud to feature a guest post today from our friends at Indoor Paws, a site that is a dedicated resource center for owners of indoor cats. 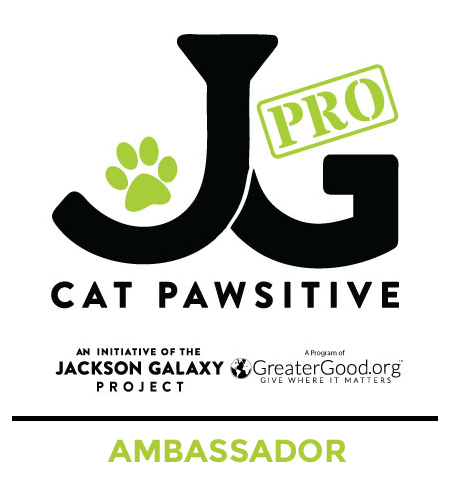 This guest post from Indoor Paws is an excellent follow-up to our post on declaw awareness. Scratching and stretching is extremely important for cats. When cats roam outside, this activity will mostly take place there, using rocks, trees and rough surfaces to keep their claws on form. However, when keeping an indoor cat it is your responsibility to provide scratching opportunities for your kitty, and to allow them to express this very natural behaviour. Your cat’s claws will serve them well should they escape and go missing. Your cat will need their claws to ensure their survival in the outside world. Your cat’s claws contribute to them remaining a happy feline. Before we look at some ways you can encourage your cat to scratch appropriate furniture, let’s have a look firstly at why your cat scratches and what purpose this serves. Cats like to mark their territory, and one way of doing this is by them leaving a visual clue to other cats as to who roams the area. Nothing says “I live here” more than vertical scratch marks. Cats also carry pheromones in their paws (and many other areas of the body) and scratching gives your cat the opportunity to leave this pheromone (or scent) in their territory and is one of the main ways cats communicate. Often, cats will scratch and mark areas of the house they feel there could be a threat, such as near the entrance of the home (front door). It’s important that you give your cat lots of space and cat furniture to mark so they can exhibit this natural and healthy behaviour. Cats handle stress and anxiety in their own ways, and what affects one cat won’t necessarily affect another. However, most cats are very sensitive to their environment and can easily become anxious or stressed if put through too many quick, unthoughtful changes in their environment. Cats will scratch as a natural way of temporarily relieving and showing anxiety and stress. Some common reasons for anxiety in cats are separation anxiety, new furniture entering the home, confrontation with other cats or extreme noise in the environment. If you have many visitors entering your home that your cat isn’t used to, this can also cause stress and cause your cat to scratch more than usual and on undesired furniture. 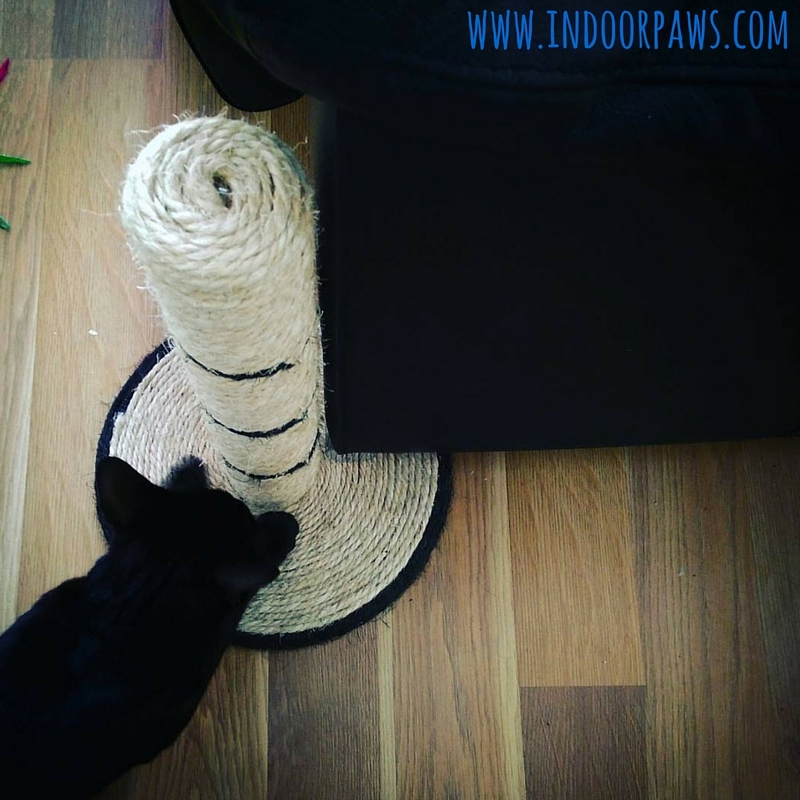 A common time you may observe your cat going straight for their scratch post is when you return home from work or from being out of the home for a period of time. This is because your cat is pleased to see you and is happy for your return! Your cat will scratch out of contentment and happiness, so take it as a sign of love toward you! It’s important that your cat is able to naturally shed the dead outer layer of their old nails. When cats have access to the outside they can use trees, wood and rough surfaces like rocks to naturally remove old dead nails, but when your cat is kept indoors, they need to be given this opportunity by you. Provide your cat with plenty of scratch pads and posts so they can regenerate their claws naturally! Each claw will usually naturally shed around once a month. Prime time for stretching is the morning. When your cat wakes up, it will usually go to the nearest and easiest rough surface it can find, for a long, whole body stretch. You will probably notice that your cat likes to stretch out its entire body by reaching the highest point of their scratch post. Cats love to be able to stretch their entire body and this is done when they are happy and content with their environment. Your cat needs to feel alert and ready to respond to a threat at any moment. This natural behaviour trait means that they need to feel their limbs and muscles are ready for action. Your cat will stretch out all of its muscles and limbs, reassuring themselves that they are ready to take on the world at any moment. If your cat is using the ground to stretch out their front and back legs, rest assured this is a good sign your cat is on form and feels extremely comfortable with you. So, how can you stop your cat scratching at your best pieces of human furniture? The first thing you need to do is make your human furniture as unappealing to your cat as possible. Cover the corners of your sofa and chairs with foil or greaseproof paper. These materials are unpleasant for your cat to scratch and they won’t want to continue using them for their benefit. You can also use a material that is silky in appearance as this is also undesirable to your cat. Now that you have made your furniture unappealing to your cat, you will need to ensure there are adequate cat scratching posts and trees in your home. By providing a really appealing cat tree or post, you give your cat a better option to choose to have a scratch on. Make sure that any scratch posts that you use are extremely stable from the first use. If it topples over or is unstable from the minute your cat uses it, your cat will not return for another scratch and will find another location. TIP: If you are using a stand-alone scratch post, place the corner of your sofa over the top of the edge of your post to sturdy it. This will ensure your cat uses it and returns! Every time your cat uses an appropriate scratching place, praise your cat with your voice and throw them a healthy treat. This will enforce the good behaviour. If your cat attempts to scratch your furniture, say a stern ‘NO’ once. Ignore your cat for a short amount of time after. This will give your cat the message that scratching here is not allowed, and reinforces the appropriate places to scratch. The above technique will take time and patience, even with the most obedient of inappropriate cat scratchers! Do not give up. Make sure every member of your household is on board with the training technique. If your cat is given the opportunity to scratch a chair by one member of the family, but the rest are discouraging it, your cat will feel confused and conflicted. Have patience with your kitty. 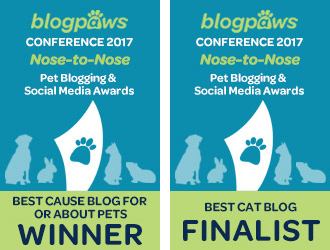 If you own an indoor cat and would like to be inspired by like-minded people, join The Indoor Paws Community and see how others can help you! 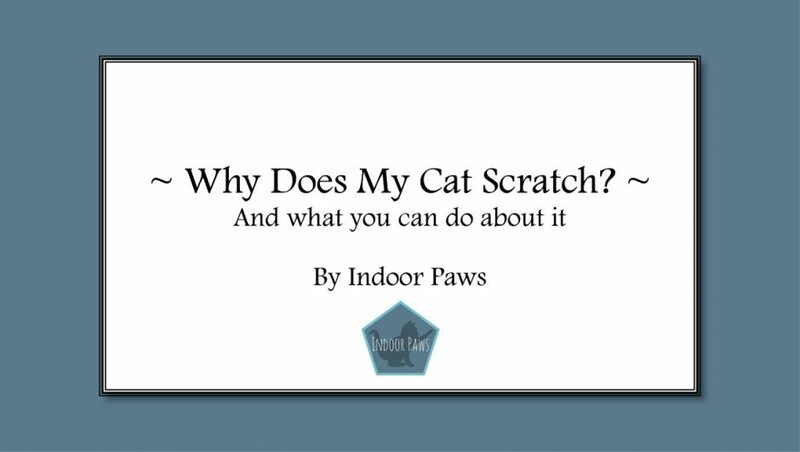 A big thank you to Indoor Paws for providing this article on scratching behavior and tips to keep your cats from scratching your furniture. 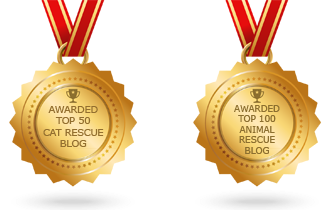 We hope to feature more great articles from Indoor Paws in the future! You will want to visit Indoor Paws, which is full of great articles and tips for indoor cats. 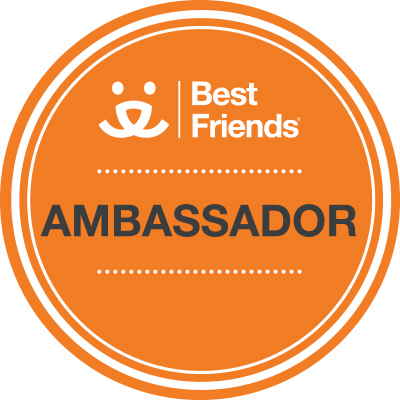 You can also connect with them on Facebook, Instagram and Twitter. So, how do you keep your cats from scratching the furniture? 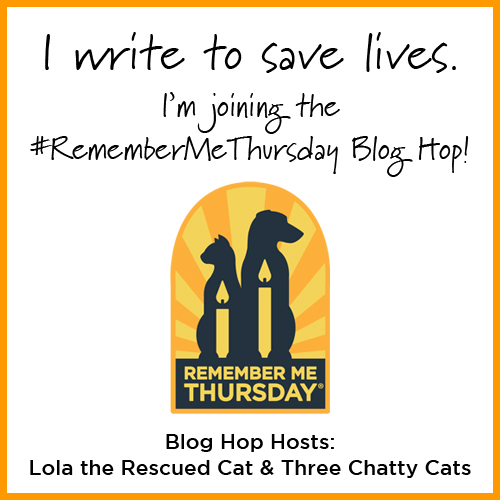 Follow Three Chatty Cats on Facebook, Instagram and Twitter! Previous The Peter Zippi Memorial Fund Inc.
Haha, I bet! Sometimes our cats will do a big, morning stretch on our pant legs. Nothing came up for me with that link. What’s the post name on your site so I can search for it? What a great post!!! We have cat trees and scratching posts in just about every room. Our cats truly prefer their posts and trees to our furniture. We make sure that the texture of the posts and trees is something that attracts them and that the scratching posts are high enough for them to stretch out fully. Rubbing a little catnip on the posts from time to time also helps to attract them to these areas. Maybe we are very lucky, but from the time they are small kittens they have these resources! Purrhaps that helps also!!! Catnip is a great idea! For the most part, our cats use their posts, but they’re actually more interested in our carpet than our furniture. We have several bald patches throughout the house. :-) But we prefer our cats to our carpet, so we just live with it! Excellent post! We have stand alone scratchers, and when my husband built a bench/seat for the kitties for the living room, he made each leg a scratching post. I’m wondering this: we tell the kitties no when we see them scratching on furniture except if it’s furniture in the kitty zen room, a room we have for cats and humans to be comfy in (lots of cat stuff, seats for reading, TV, etc. I am wondering if we’re confusing them to allow them to claw that furniture and not the furniture in other rooms. 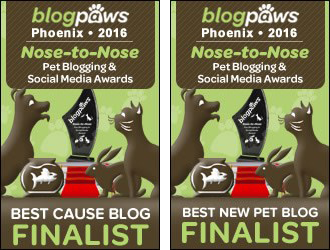 TIna, here’s what Indoor Paws said: Hi, thank you for your comment, a kitty zen room sounds absolutely brilliant! In our opinion, as long as you are 100% consistent with your rules and your training you aren’t confusing your kitties. If you allow your cats to scratch some furniture and not others they do need to know that the particular furniture they can scratch is ‘theirs’, this requires consistency to avoid that confusion. Every member of your household should follow the same set of rules, as any flaws in the training, especially in the early stages, can leave your kitties confused and frustrated. It sounds like you have your training routine in good order, so as long as you are consistent we think it’s a great idea to allow your kitties to ‘own’ certain furniture, the fact that this furniture is in a separate room further enforces the boundary, which is great. We use strap around scratch posts ourselves, which tie around table and chair legs and we think they are a great addition to the environment. Good luck, and do let us know how you are getting on! Excellent post. I would rather have my furniture destroyed than declaw. I notice my cats scratching as a release of emotion. When I come home they run to their scratchers, when they are hungry, or just after waking up. You’re right! Sometimes after a zoomies session of racing around, my cats will run right to the scratcher, have a good scratch and then start zooming around again. We’re scratchers here so the mom says these are some good tips to keep us from scratching things that shouldn’t be scratched. These are great tips! It always drives me crazy when people give up their cats because they scratch…it’s a human problem, not a cat problem, because there are so many solutions to the problem. Great tips! I have a ton of scratching posts. We read that cats also scratch when they’re excited. I do. When I know that TW is about to play with me, I run to the nearest scratching post and scratch away. Some really good tips! Our cats don’t scratch on furniture, only on their scratching posts and we have heaps of those around the house. It’s something that takes a little patience but pays off in the long run! Great info! This is so important for cat owners to know, especially new cat owners. It’s so sad that so many cats are surrendered to shelters because of scratching. Knowing the reasons behind cat scratching helps to know how to prevent them doing it to your furniture and other unwanted places. Thanks for sharing this info! Thanks for sharing these great tips. We have scratching posts all over the house to avoid the temptation to scratch on furniture or carpets.